Most research studies have concluded that more than 70% of a typical company’s intellectual property resides in their email messages. Email is now being introduced into more than 90% of court cases as admissible and reliable evidence. With email now being the standard of business and personal communications, secure retention and swift accessibility of past email communications is an absolute must. Failure to protect and properly archive your email history could be hazardous to the health of and perhaps even the life of your business. However, there is a perfect solution that can leave you resting easy and secure in the knowledge that your business is fully protected and covered. 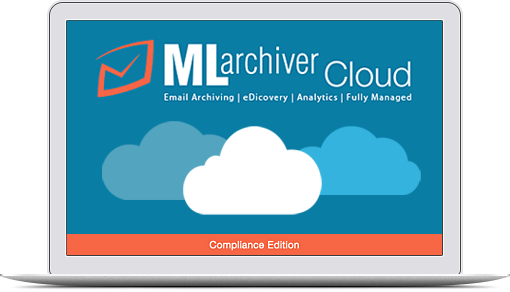 The MLArchiver Cloud from Data storage corporation brings to you a unique and potent combination of archiving and analytics that will deliver the solutions that meet your compliance requirements while also producing meaningful data to assist you in the operation and protection your company. One of the greatest benefits of the MLArchiver Cloud from Data storage corporation service is that your data remains highly secure through the utilization of cloud technology, without requiring physical equipment installations in your place of business. But with instant accessibility, as well as full implementation of the Smart Archiving™ technology by Data storage corporation, you can be assured that one of your most valuable assets, your email, is fully protected. Fully Managed service starting with 50GB of storage. Scalable to as much storage as needed. Server size is for approximately 25 employees and under. Fully Managed service starting with 100GB of storage. Server size is for approximately 50 employees and under. Fully Managed service starting with 200GB of storage. Server size is for approximately 100 employees and under. Fully Managed service starting with 500GB of storage. Server size is for approximately 300 employees and under. Fully Managed service starting with 750GB of storage. Server size is for approximately 500 employees and under. Fully Managed service starting with 1,500GB of storage. Server size is for approximately 1,000 employees and under.